Iris Anna Regn, L.A. County Arts Commission’s Civic Art Project Manager, gives LA Forum the scoop on their initiative titled “Part of the Solution: Yes to ADUs.” LA Forum will co-sponsor a related panel discussion and exhibition this Thursday, May 24th, in which practitioners discuss the project’s innovative proposals and the technicalities behind building ADUs in the city. For those who aren’t familiar, please tell us about the ADU competition, and give us a little background on your involvement in orchestrating the competition. For almost a year I have been consulting as a Civic Art Project Manager with the Los Angeles County Arts Commission. Civic Art at the Commission is defined broadly and includes capital and temporary projects, as well as social practice artwork, depending on what serves the specific situation in this 4,000 square mile community the best. Our goal is to support the development of second dwelling units, also called accessory dwelling units, ADUs. In this, we are including the creative sector as “creative strategists,” and capturing their work as both an inspiration and resource for thinking about ADUs. The project is one of L.A. County’s Homeless Initiative program strategies to increase affordable housing. Our partners in this are the Community Development Commission and the Department of Regional Planning. This Initiative Program is made possible through Measure H funds (Measure H, if you remember, was the L.A. County ballot measure that will generate $355 million annually for services and programs to prevent and combat homelessness in the County, and was approved in last year’s election). For you, what was the most surprising thing that has come from the competition entries, or from out of the conversations you’ve had around the entries while conducting the juried discussions through the process? In the research into designing the competition brief, we discussed challenges such as affordability in construction means and methods, shared space, what design excellence or sustainability might mean for the design of an ADU, along with adaptability to the varied site configurations of single family dwellings in the County. Many of the conversations around the design submissions, however, enlarged the issue of adaptability to also include different kinds of change over time for homeowners and their neighborhoods. 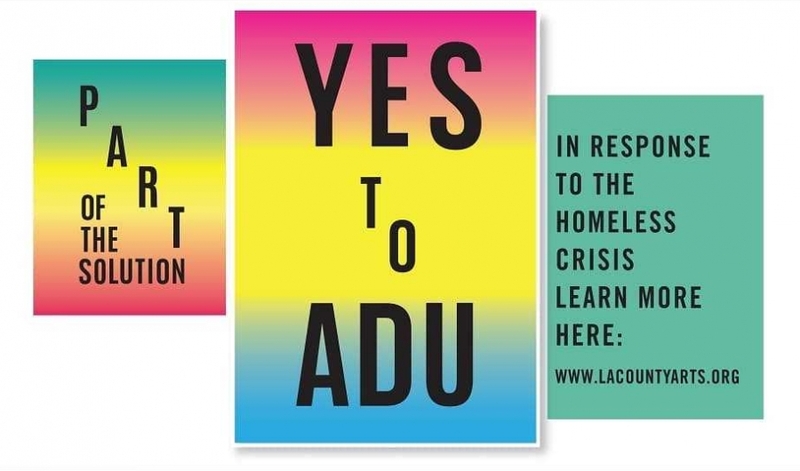 What do you want every designer reading this to understand about ADUs and their potential for changing L.A.’s residential landscape, either in terms of design, financing, or how we all live together in the city? These small owner-initiated dwellings can contribute to preserving communities by replacing displacement as the main response to increasing housing costs. ADUs are a new building typology that involves a particularly holistic way of thinking about sustainability and the relationship to existing residences and shared green space, which is very exciting from a design point of view. Sometimes design and architecture can seem removed from policy but they actually work best together. Photo courtesy of L.A. County Arts Commission.